Things are looking better, not 100%. I think this is my third week on the regimen. I saw far less pimples come to a head this week. Seems that the hard bumps (cysts?) along my jawline are slowly decreasing in size. They still hurt though. I'm also still peeling slightly and have got to use a new foundation makeup! The stuff I'm using is a caking nightmare. My face certainly is less sensitive and red. I went right from retin-A to BP so it was painful for a while. My scars are visible but that's so much better then active pimples! This is also a good time of the month. Let's see what happens when I become premenstral and then ovulation time. Sometimes that can be worse than any other time. 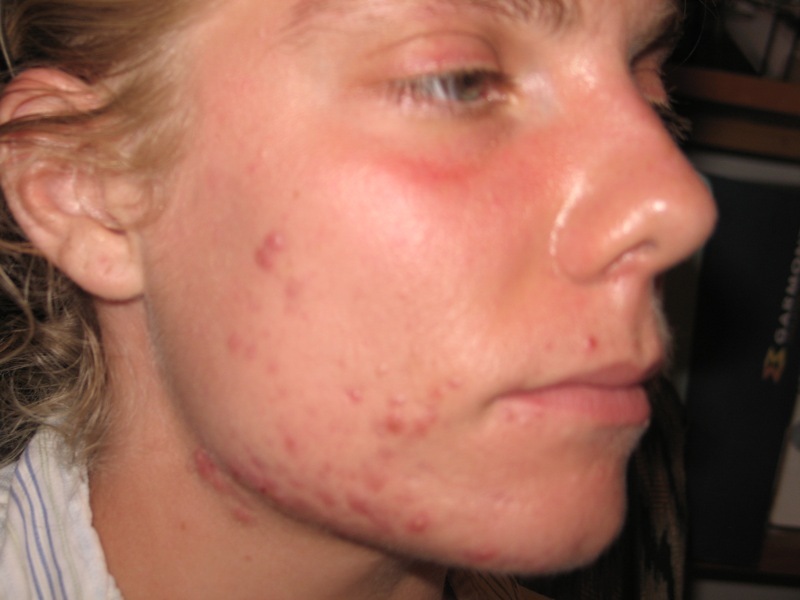 Perfect case study for hormonal acne. Umm I'm looking oily and OMG is that.....is that a mustache? Will the humiliation ever end? Not humiliating! More than anything I think you mostly look tired. And you DON'T have a moustache! just keep going i hope things improve for you, if not go see a derm and see what they think..
Hey - I see BIG improvement in you. And no, you don't have a mustache and you don't look hideous. You do look slightly sleepy - but big deal. Keep up the good work. I used to have every type of acne - cysts along my jaw line and then all other types on face, chest, back, shoulders. Yeesh it was horrible. If you are seeing this sort of improvement already - then you'll keep getting better. If you know that when "that time of the month" comes that you break out worse, step up your program and don't miss a beat during the days before and after you expect things to worsen. Oh - and while it didn't rid me of acne, I do take Ortho tri cyclen birth control pills - because it takes the big flares out of the cycle somewhat and does seem to lessen it somewhat. Just an idea to throw out there for you. Ultimately, my saving grace has been my 10% AHA that I use 2x a day. When I don't use it, the acne comes back. So anyway - you've got your regimen - it looks like it is working. Even if you have to tweak it a little - know that you will make it!